As the world culture redefines the concepts of community and fellowship, today’s church needs to spend time looking at how church members relate and minister to each other. With a title like Counseling One Another: A Theology of Interpersonal Discipleship, Paul Tautges’s work seems to be ready to answer the call for how Christian could minister to each other. The result is a book which does little beyond repeating the message and content of the gospel and how God seeks to use that to shape the lives of sinners. The gospel is certainly the necessary starting point in the counselor and their worldview. However, Christians can maintain the supremacy of Scripture without the false dichotomies which exclude ministering to an individual who is not saved or de-emphasis knowledge from the scientific community. While the gospel message is true, it falls inadequately short of counseling. As a result, many unique counseling issues are simplified in Counseling One Another as if dealing with sin is the only concern. This is best exemplified in chapter 3 which argues that alcoholism and homosexuality are not a disease or biological/hereditary condition but “sinful lifestyle” (51-53, 56). Much of this mentality stems from Paul Tautges’s potentially extreme views on the gospel. He says, “the gospel is a message that God commands us to believe” [emphasis original] and “Understanding the gospel as a command to be obeyed has radical implications for discipleship” (27). Tautges is right, it does have radical implications — radically bad. The gospel is no command the unbeliever can willingly obey without the work of God imparting faith to man. Lutheran and Reformed theology would describe this as a confusion of Law & Gospel. More importantly, all Christians should see this language as obfuscating the line between justification received freely and sanctification. In conclusion, many of Paul Tautges’s conviction are profitable but, on the whole, this presentation should be rejected. 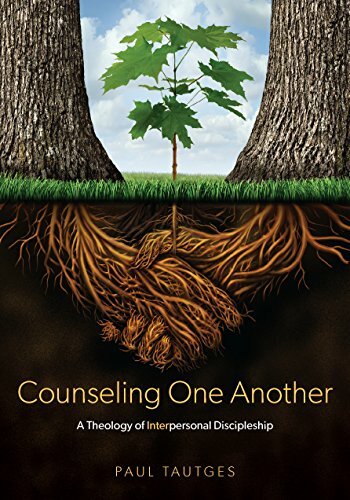 Counseling One Another provides little beyond a recap of the gospel and certainly nothing like inter-personal discipleship in sanctification.